The late Dave Staples, then president of The Archery Hall of Fame and Museum; Jay McAninch President/CEO ATA; Jim Dougherty, award honoree; Sue Dougherty, Jim’s wife of 46 years; and Steve Scott, chairman of POMA. JOHNSTOWN, Pa. – History was made Jan. 11, 2008, at the ATA Trade Show at Indianapolis, Ind. 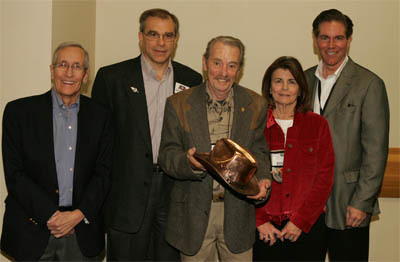 The inaugural recipient of the prestigious POMA/ATA Fred Bear Archery and Bowhunting Communicator Award was revealed. Veteran archer, bowhunter and journalist Jim Dougherty of Tulsa, Okla., was named the 2008 honoree. As he held the award, a bronzed, Fred Bear, signature, Borsalino hat, complete with turkey feather and Pearly Everlasting wildflower adorning the hatband, Dougherty reminisced. Jay McAninch, Archery Trade Association CEO/President, agreed. Book author and magazine writer, currently on staff with Petersen’s Bowhunting and Archery Insider. A native Californian, Jim now lives in Tulsa, Okla., with his wife of 46 years, Sue. He hunts and fishes with his five sons and 13 grandchildren. A display honoring Dougherty and future recipients of the award will be housed at The Archery Hall of Fame and Museum within Wonders of Wildlife at Springfield, Mo.